Norhyati (second left) presents certificate of participant to a workshop participant. KUCHING: Sarawak talents must strive to be the best that they can be and compete with their counterparts throughout the country. In this respect, Angkatan Zaman Mansang Sarawak (Azam) board member Dato Norhyati Mohd Ismail believes that the locals deserve the chance to shine. 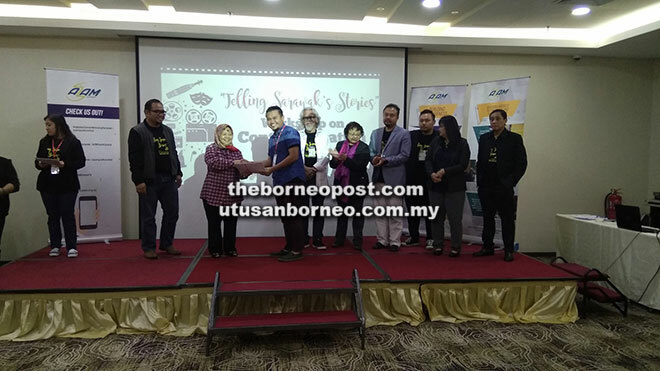 “We want our talents to become real players and directors – among the best in Malaysia,” she said at the closing of Azam Sarawak’s workshop on content creation themed ‘Telling Sarawak’s Stories’ at a hotel here recently. Norhyati, however, admitted that the main constraint is funding. As such, she expressed hope that the state government could help in this area, saying: “Maybe (covering) 10 per cent of the cost while we seek other (sources of funding), as well as to help them (talents) promote their work. The one-day workshop gathered 100 participants comprising local filmmakers, members of film associations, entrepreneurs and undergraduates. The sessions included talks conducted in English and Bahasa Malaysia, by five speakers on their own specialties.